You are in store for quite a delicious surprise this morning. Something that even caught I, the great Sandwichologist, off guard. 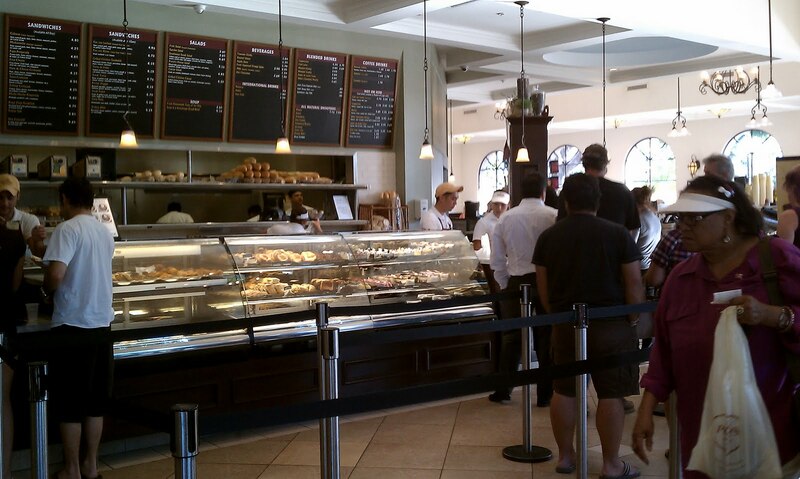 I have always heard wonderful reviews of a place in Burbank called Porto’s (also with a location in Glendale). 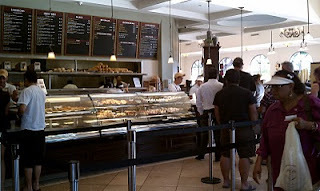 And despite passing it numerous times on my way to downtown Burbank, I never stopped in to try it. Well this time was different. 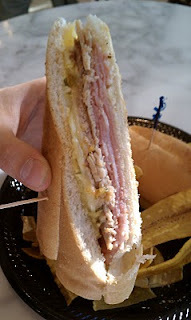 I had a date with one of LA Magazine’s top 17 sandwiches of Los Angeles: The Cubano. When I first walked into the shop I must admit I was slightly stunned at the interior. This place is huge, bright, and very fancy looking. After taking the atmosphere of the place in, I ordered and took a seat by the window. 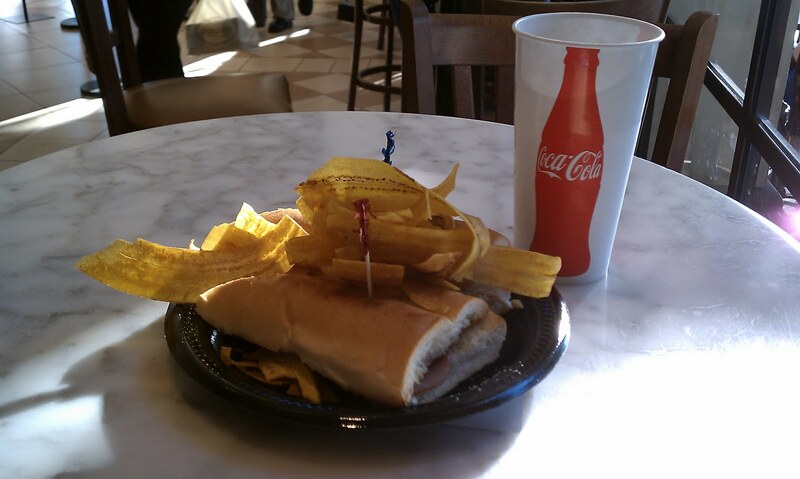 My waiter brought my sandwich, and for a moment, I stared at my next challenge: The Cubano. Made up of slow roasted pork, ham, Swiss cheese, butter, mayo/mustard, and pickles on Cuban bread. This is what people have raved about. I took my first bite and I felt as if my tastebuds started a cha-cha-cha in my mouth. It was a flavor explosion, and I loved it. The slow roasted pork is of excellent quality. It’s tender, juicy, and full of flavor. It had definitely been stewing for quite some time before being added to the sandwich. Normally, I’m not much of a fan of ham (although bring on a number of other pork products), but I definitely enjoyed it on this sandwich. Working together with the full flavored pork, the ham added a nice, more subtler secondary flavor. The bread was flaky and soft and complimented the contents very well. I feel if the bread had been thicker or heavier, a lot of the taste of the sandwich would have been lost. This bread allows the flavors to fully attack your tastebuds. Now normally, I’m not much of a fan of Swiss cheese, but it really did add an excellent taste to the mix. Smooth, with a strong flavor, and perfectly melted on top of the meat, this was an excellent choice. Top all of that off with a little mayo, a little mustard, and some dill pickle chips and you have the Cubano. In place of fries, which would have weighed down this sandwich and not have been as enjoyable, Porto’s added lightly fried banana slices. 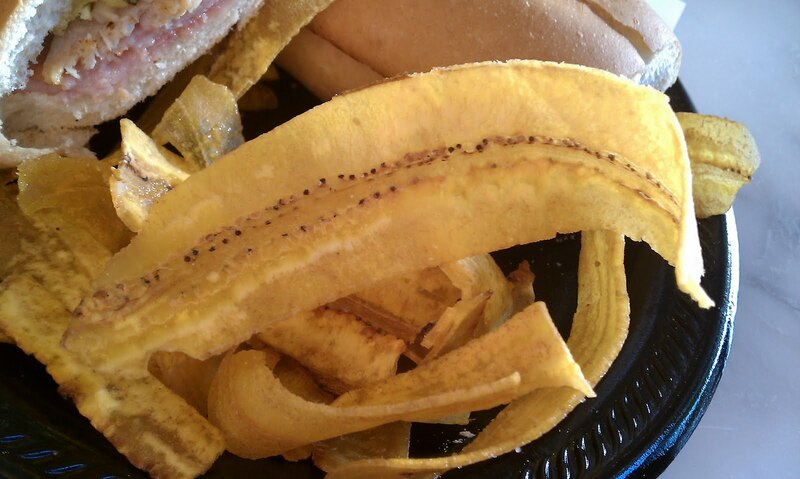 Thinner than normal banana chips, and sliced lengthwise, they were light, airy, and crispy. A perfect addition. Danger fans, I know you trust me to be completely honest with you in my opinion. You trust me to lead you in the direction of delicious sandwiches, and eventually to the sandwich which will be so DANGERous, as to take my own life away. So believe me when I say that so far, this is one of the best sandwiches I’ve had for this blog. If you’re in Los Angeles, you really need to try this. I can guarantee you won’t be disappointed. Awesome! Cuban food is always a good thing. Love tostones as well – that would be double-fried plantain chips. Just as fantastic as fried banana chips, at least in my opinion. this might be my favorite so far!!! sounds very good and very dangeroussssss….